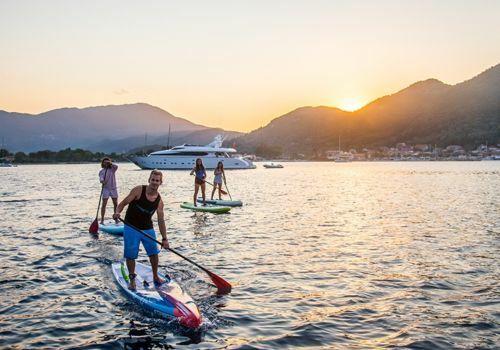 For many of our clients who like to travel on their own, Healthy Options is a chance to meet like-minded people and participate in a wide range of Yoga, fitness and fun activities in our beautiful Greek Island location. So, if you feel you need a complete break from the fast pace of work and life and you would like to return feeling rejuvenated, fitter and stronger, then this could be the perfect holiday for you. And, while we don’t have any dedicated single rooms in our hotels, we do offer our excellent ‘Willing to share’ arrangement so that you if you are prepared to share a room with another of our guests there is no need for any single supplement AND at certain times of the year we offer Special Offers should you want a room to yourself. A typical day in our Healthy Options resorts can include your choice of the following: Guided bike rides – we cater for all levels with a relaxing ride through the olive groves, or maybe a harder 20km ride is your thing? You might prefer to start your day on the water, paddle-boarding in the flat calm of the morning or simply relaxing on the beach terrace taking in the views over to the nearby islands of Cephalonia and Ithaca as you eat your breakfast. Heaven! Throughout the day we offer a variety of classes on offer including, Flow Yoga, Hatha Yoga, meditation and Pilates for all levels. All of our classes are professionally taught by our friendly and approachable team. If you’d like to increase your fitness then why not try run circuits, a Swiss Ball class, Body Sculpt or a HIIT session. In Vassiliki, you can even try sailing and windsurfing if you’re feeling adventurous, while in Syvota our rafting expedition to the Acheron springs in the foothills of the Pindus mountains is always popular. There is no such thing as the average Healthy Options group. Each week the selection of people on the Healthy Options holiday changes completely. It keeps life interesting for the Healthy Option’s instructors at our 2 locations of Syvota and Vassiliki.